God has given me different gifts just like he has for each of us. My gifts do change depending on what he has called me to do. I have had the gift of teaching but now that is reserved for my children specifically. He’s given me the gift of leadership which I have always struggled with but I have followed his direction. Kindness and Love is a gift that I have been given as well. I have thrived in each of these gift from time to time but during church Sunday I was prompted to figure out what gifts God has given me now that we are in Oklahoma. I don’t know many people so it’s hard to fit into any of my previous gifts, at least outside the home. Well I was thinking about it and in my life right now I can almost see how each of these plays into my life now of Family First. Serving Others: I serve my family everyday by waking up and making coffee, breakfast and helping Hubby get out the door for work. I serve my boys all day long and when Hubby returns I serve again by cooking dinner, cleaning the kitchen, making homemade cookies or bread. Also keeping the dust and dirt to a minimum to help keep allergies at bay as much as possible while living in the country. Teacher: Well it’s no secret that we are a homeschooling family but teaching isn’t just about school. Teaching my boys to have good character. Teaching them to love and fear the Lord. Teaching them to care for themselves. Potty train. Clean up the toys. Sort the laundry and put it away when it’s folded. All teaching on top of teaching to reading, writing, and math. Encouraging Others: Mom’s are constantly giving encouragement! Encouraging Monkey through his struggles with learning how to read and write his letters better. Encouraging Goose with going to the potty, putting on his own socks, and eating his food with a fork or a spoon. Encouraging Hubby after a hard day at work or when an unexpected expense comes and we have to find a way to fit it in our budget. Encouraging myself to stay on track with eating healthy so I can live the healthy life that God has called me to live. Encouraging myself that I’m doing the right thing when the world is screaming at me that I’m not. Giving Generously: Giving our funds to the household, Hubby and kids above my own needs. Making sure that they have everything they need first. Making sure I buy something Hubby really likes having around when I make my weekly grocery shopping to let him know I was thinking about him. Giving my time to cuddle with them in the morning before I get out of bed. Giving of my time when Monkey and Goose want a story read to them even though I’m in the middle of cleaning. Leadership: Although Hubby is the leader of our family I still have many leadership roles. Being in a marriage with an unbelieving husband means that I have to be the spiritual leader for myself and my boys. I have to set the example of living a life the way Christ has called us to. I also have to lead them in good character. Showing Kindness: Setting the example of showing kindness to others while we are in town. Helping the elderly couple take the cart to the corral. Giving smiles to the other mom in the store that is struggling. Saying excuse me and thank you to those around us. Really LOVE THEM: How can you not love your family! Of course we all have our moments of not being easy to love but part of really loving someone is loving them through those moments. Accepting them through the times of struggles. Being there for each other. Giving the other what they need most when they need it. Really loving my family seems to come the easiest! Now am I doing the last thing God has asked me to do? Am I lazy? Do I work hard? Do I serve Him enthusiastically? I want to answer YES! 100% but it wouldn’t be true! I struggle every day to fight laziness! I have plenty to do to work hard. I mean I have a Hubby, and two young boys, plus 2 dogs, a house and a full acre fenced yard. All of that creates more than enough work for me. But we live in a time when laziness is easy to give into. We have on demand TV programs like Netflix where you can watch entire seasons without having any commercials or waiting until next week. We have Facebook, Twitter, Instagram and I’m sure plenty of other social media to fill our time with. I have enough blogs I like reading that I could probably sit in front of the computer for hours just reading encouraging post about not being lazy 😉 And there are days that I waste much of my time involved in all of the above. The list above is all ways that I use these gifts that God has given me but I don’t do them well every day like God asks of me. But because of last week I’ve been thinking about it. All week. Off and on at least. Maybe not when I was sitting there being lazy watching my third, maybe fourth, episode of my guilty pleasure on Netflix. But I have been thinking about it and I have been finding ways to make changes in my life. I have my day planner/homeschool plan book that I try to write in every day at least what I want to accomplish or what I did accomplish. I started a food journal to help encourage better eating which benefits everyone around me. I almost have the house back together and in a more organized why after our surprise leak under the carpet in our bedroom last week. But I know that if I were to do what I have listed above every day and I did them well and enthusiastically my life would change dramatically as well as the lives of those around me! So that’s my new goal! I’m going to work hard and serve the Lord enthusiastically each and every day. I know by doing this He will feel closer and our relationship will grow. What are your Godly gifts? Are you doing them well? Could you improve on them and change your life as well as those around you? I encourage you to pray and find ways that you can improve the gifts God has given you! I’ve done all sorts of Bible studies during this time. I’ve done the traditional study of actually reading and discussing books in the Bible. I’ve done book studies that you can buy at every Christian bookstore around. But the one thing I haven’t done is read through the entire Bible. Actually when I started thinking about it I realized just how few books of the Bible I have read in the last 12 years. It is quite sad and I’m sure my relationship with God is lacking because of it. So why now? Well one of my closest friends back in Colorado mentioned to me that she was reading through the WHOLE Bible in fast track style. Basically as many chapters as she could get through each week. I expressed how awesome I thought that would be to do and started to consider trying it myself. But I know myself and I know that I would never accomplish that task on my own. Well luckily for me my friend is awesome and offered to pause her journey and wait for me to catch up. Lucky for me she had only been doing it for a few weeks. 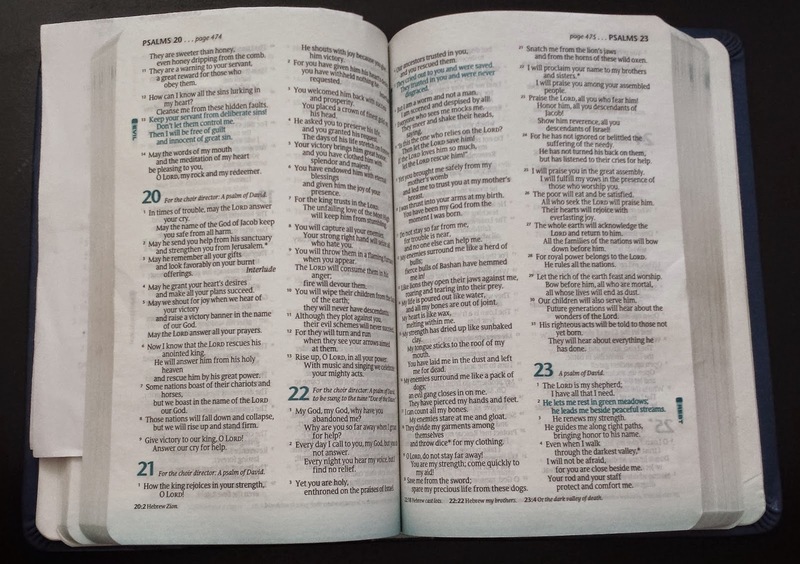 After completing the 50 chapters in Genesis the first week I was excited for week two to start and read through Exodus. Now as we enter the new year we are in 1 Kings and I’m really enjoying reading about 40 chapters a week. During this time God has revealed himself several time to me. I’m really enjoying the time that I get to sit and read. I’m really getting the whole picture of the stories that I have heard over and over. Have you ever read through the Bible? What amazing things did God show you during that season?